How would you like to get a $299.99 Moto Mod for free? Verizon has a deal going on involving the modular accessories that stick to the back of the Moto Z and Moto Z2 series handsets. Purchase any Moto Mod from Big Red and get the Insta Share Projector Moto Mod for free. The latter is usually priced at $299.99. Considering that you can get a Moto Mod for as cheap as $39.99, this is actually a very good deal. Out of stock are the SoundBoost Moto Mod, juice Pak Battery Mod, and the Style Shell Moto Mod. While the Insta Share Projector shows as also being out of stock, reportedly there is enough of them left for Verizon to meet its obligations. 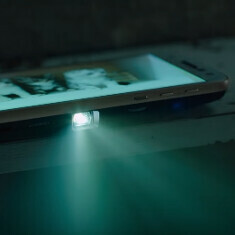 The Insta Share Projector Moto Mod projects images from your Moto Z screen on to a flat surface, while blowing up the image to as high as 70-inches. It's already out of stock.